Zambezi marimba band plays music of the world with heavy African influence. Club Zambezi Dance Party combines an exciting musical fusion with irresistible dance beats. Founded in 1992, Zambezi was originally inspired by traditional Zimbabwean marimba bands. 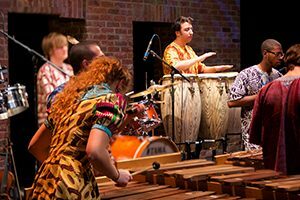 The musicians of Zambezi perform on specially designed and custom made marimbas -- the Zambezi group has an even wider range than its … Continue reading "Club Zambezi Dance Party"